This is the latest news from the South Lanarkshire Eco-Congregation network. Exciting new developments from the Local Networks Seminar 2015 – Report now available! The 2015 Local Networks Seminar took place in Dunblane on Saturday 26th September. This year the main themes discussed at the Seminar have been used to propose an exciting new way of providing web-based resources, which can be downloaded and printed out to encourage more participation in our congregations. After considering what other resources are available, the ECS Board now plans to invite individuals / congregations / networks, with the relevant experience and expertise, to contribute to developing and writing the new resources. Local Networks Seminar Report 2015 also lists a whole host of topics and speakers from networks all around the country (see Appendix 3). If you are not already involved in a network, take a look and see what you might be missing! Everyone is welcome at network meetings – you don’t have to be from a registered congregation. Full information about your local network can be found here. Presentation given by John Ferguson from EcoideaM Ltd on 26th September at the Local Networks Seminar. A full report of the day will follow. Local Networks Seminar 2015, Saturday 26th September. This year’s Local Networks Seminar is being held on Saturday 26th September, 11am – 3.30pm at Dunblane Cathedral Halls. Please note the date, which is later in September this year. The Climate Justice Baton Relay (see http://www.ecocongregationscotland.org/get-involved/events/baton-relay/) has been a huge success. The Baton has been (double!) booked every Sunday, and many dates in between, since its launch in April until it departs for Paris at the end of November. Congregations from Orkney to Dumfries have taken the Baton into their churches, schools and community centres, paraded it through the streets, taken it up mountains and on pilgrimages to spread the message that now is the time for Climate Justice. John Ferguson of the Binn Eco Park has agreed to start the discussion by giving us an overview of the issues and how these relate to what we can do in church and community. John is a Christian, who formerly worked for the Scottish Environmental Protection Agency and is now running a ground breaking environmental business. He is an inspirational speaker with a wide knowledge of and insights into the issues. You can download a short biography for John here. Trevor Jamison, our environmental chaplain will be offering some biblical and theological insights on the theme. There will also be time allowed for the usual exchange of news and views and networking between the networks. A full programme for the Seminar is available for download here. Places are limited please therefore book your place by replying to margaret@ecocongregation.org.uk by Monday 7th September. For those unable to get to the Seminar we will be producing a Report of the day and consulting more widely on the outcomes. Saturday 26 September at Dunblane Cathedral, 11am-3.30pm. After Paris – What Happens Next? Monday 14th Sep, 7.30 – 9pm Highland Network at West Church, Cromarty – an opportunity to see their air source heat pumps. Would you like a theatre group to visit your church? 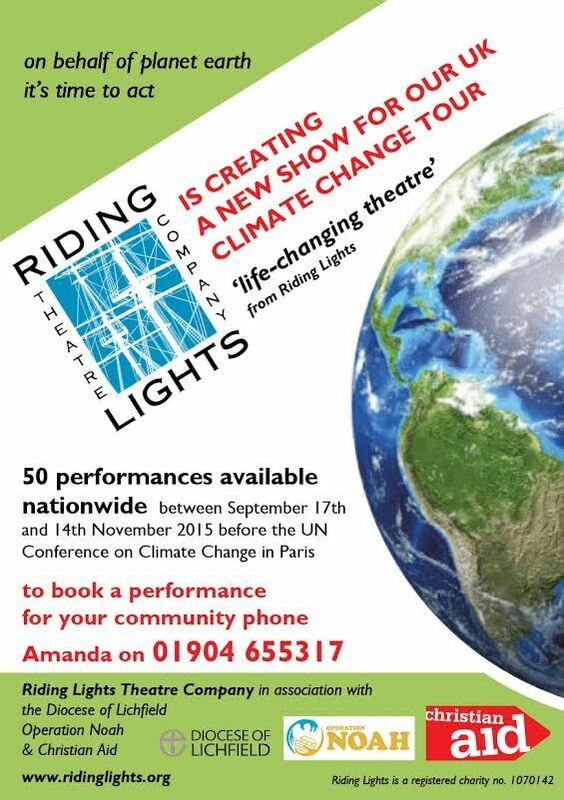 The Riding Lights Theatre Company will be touring a new show about Climate Change from a Christian perspective between September and November this year (see details below). So far only two churches in Scotland have shown an interest, but if there is sufficient demand they might put on another week touring Scotland – from 16th November. If you are interested please contact them via their web site www.ridinglights.org.